A new senior accountant has joined the team at CCF Accountancy in Harrogate. Lisette MacGrath has six years’ experience in accountancy practices in Liverpool and Harrogate. In her new role, she wants to progress her career by finalising her ACCA qualification next year. I’m really pleased to be joining CCF and I’m looking forward to getting to know the clients as I get settled in. The reason I wanted to work for CCF was that it’s a young and versatile company offering more than just a standard accountancy service. There’s a lot of emphasis on year-round support and planning which is a much more modern and effective way of doing things. Having grown up in Harrogate where she attended St Aidan’s High School, Lisette began her accountancy career in Liverpool, her husband Nick’s home town, before moving back to North Yorkshire four years ago. Lisette has a seven-year-old son, Joshua, and in her spare time, she enjoys zumba, bike riding and going walking with her family. Her appointment brings the total number of staff at CCF to five, along with two consultants. We’re really pleased to welcome Lisette to the team at CCF. Given her strong links to both Harrogate and Liverpool, we believe she will be another asset to the services we already offer to clients from our satellite office in Tithe Barns Street in the Liverpool, as well as the work we do from our head office here in Harrogate. 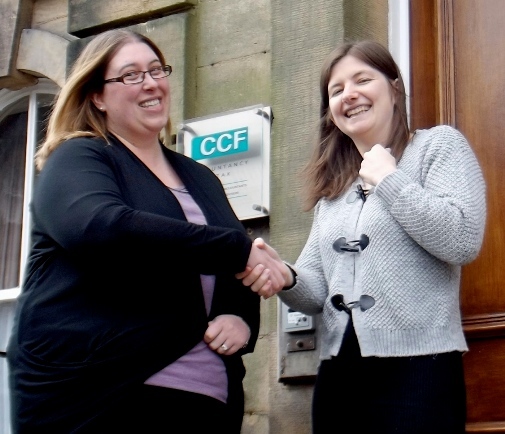 Lisette MacGrath, left, is welcomed to CCF Accountancy by Teresa Bowe.